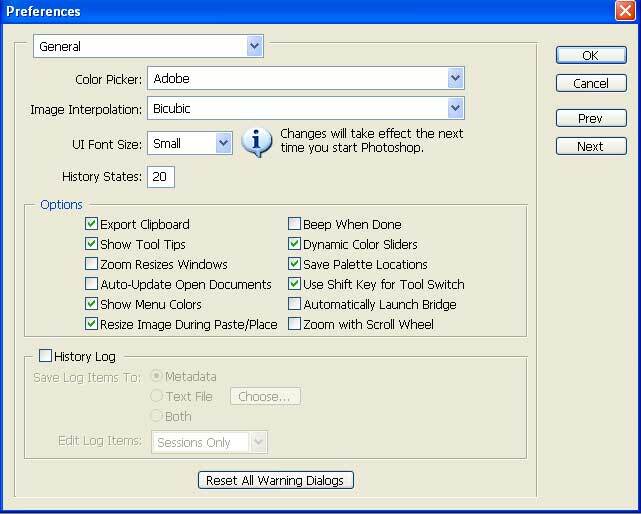 Most important when you install Photoshop is to make clear determination how this program have to work. First go to the Edit- Preferences- General. Under the General keep all what you see but you can make some changes in the History States. By the default it is 20 states but if you want to keep memory you should reduce this number. But also if you have no problem with memory you can increase this number on eg. 30 states. This present how many back step Photoshop remember and this will use in the History panel later. Next is File handling and leave it as it is. Display and Cursors leave as it is. Transparency & Gamut also leave as it is. Units and Rulers- I put the Rulers on millimeters [ mm] and type in points. I use metric measurement but there is also inches. No need to take other measurements for Type [this is the size of text] as well all use measure in points. Also no need to make any change on Print Resolution and Screen Resolution. Next step is Guides, Grid & Slices and also leave as it is. Plug-Ins & Scratch Disks is very important and go down on the area for the scratch disc. This determinate where the Photoshop should put additional data and store memory during the work. You have present as much disc as much you have it on hard disc. As well I have it four I see there four disc. Never- never- never put the first scratch on disc “C” even if you have there most space. First disc have to be the one with most space and then the rest with smaller and smaller space and the last one is the “C”. Next is the Memory & Image Cashe. Lets be clear- don’t install Photoshop CS2 if you have no at least 1 GB of RAM!!! Some under the 250 MB is used by the system and rest can be used by Photoshop. Photoshop find its brutal power in the RAM memory, you can have most expencive graphic card in the world it’s worth nothing if you have no RAM. Best choice is the Dual Chanell RAM of some 2 GB… my dream Well I have set there 85% of available RAM for Photoshop and I work smooth. Type leave as it is. Hey! , Your blog post about photoshop transparent is absolutely great. Easy to understand it and with excellent value. I just stumbled up and dugg your site to digg as good news article about photoshop transparent on Wednesday . Cheers, Mike Brown , keep up the good work !